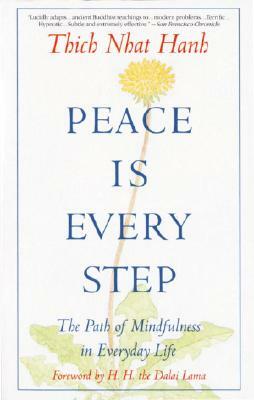 Lucidly and beautifully written, Peace Is Every Step contains commentaries and meditations, personal anecdotes and stories from Nhat Hanh’s experiences as a peace activist, teacher, and community leader. It begins where the reader already is—in the kitchen, office, driving a car, walking a part—and shows how deep meditative presence is available now. Nhat Hanh provides exercises to increase our awareness of our own body and mind through conscious breathing, which can bring immediate joy and peace. Nhat Hanh also shows how to be aware of relationships with others and of the world around us, its beauty and also its pollution and injustices. The deceptively simple practices of Peace Is Every Step encourage the reader to work for peace in the world as he or she continues to work on sustaining inner peace by turning the “mindless” into the mindFUL.